It is so important to the face painting industry and the beauty industry that good hygiene practices are followed. I have lost count the many times I have walked past face painting stations (run by volunteers or new face painters) who are just not following good rules of hygiene. Take the sponges for instance? I always use a fresh sponge for every face to avoid cross contamination from peoples faces. I also don’t dunk the sponge in dirty water. Bacteria breeding ground – Urrrggg! Every time a Fresh sponge and a spray bottle of fresh water. Dirty moist sponges? Ideal conditions for a bacteria party. Whats the worst that can happen? Just think all the childhood diseases like chicken pox, impetigo, colds, coldsores etc. I look out for these when someone sits in my chair and I politely refuse to paint explaining to mum. Also a gentle baby wipe to clean off ice creams, chocolate etc is always a nice thing to do and avoids dirtying the paints with food. If a child has had an outbreak of eczema I very often will paint a design on the arm to avoid irritation to the skin and avoid upsetting the child. There are some lovely arm designs for both boys and girls and they love it! Well I have a 4 wash system on my painting table, to ensure the brushes are clean between painting people. I also do not let my brushes sit in the water pot, water and bacteria yuck! I also have a brush soap wash in the water that keeps bacteria at bay. At the end of a job once at home the brushes are further rinsed and then soaked in a sterlising wash then let to air dry on paper towel. I only use professional quality paints that the ingredients follow FDA regulations for cosmetics. 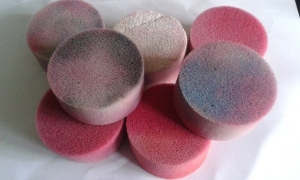 These are made specially for use on the skin and are made with FDA approved cosmetic ingredients. Only face paint / body paint is used on the skin, craft paints are just a big NO on the skin. I wear an apron to keep my clothes free from paint but also to keep a clean professional look. I regularly use hand santiser gel during the day whilst between painting and also have baby wipes to hand. I eat or drink away from my painting table whilst on my breaks too.